Ast güevo, Heb baçín, Ar. bayd, Eng. egg. These were basic in Andalusian cookery. Avenzoar explained that the most valued by people are the hens’, above all when boiled, for their nutritive properties. Eggs from all birds are hotter and drier than the bird that lays them. Duck eggs are tasty. They are hotter and less humid than those of hens. Goose eggs are similar and were considered most agreeable. Partridge eggs are lighter than those of hen. Pigeon eggs are hotter and more humid than those of the hen. Ostrich eggs are hotter and less humid than all others mentioned. (One does become overheated drilling into them!) Eggs from a peacock are heavier than those of the hen and its substance is too; of other properties, the two are more or less the same. All types of eggs were thought to have aphrodisiac characteristics, above all if boiled with onions or in turnip juice. The ground shell, instilled like an eyewash, produces clearness of vision, dries the tear and was thought useful for the eyes. The egg shell was toasted and mixed with a drink to stop diarrhea. The egg yolk was considered much better than the white. To avoid noxious effects Avenzoar cautioned, one should use the yolk only, without the white. 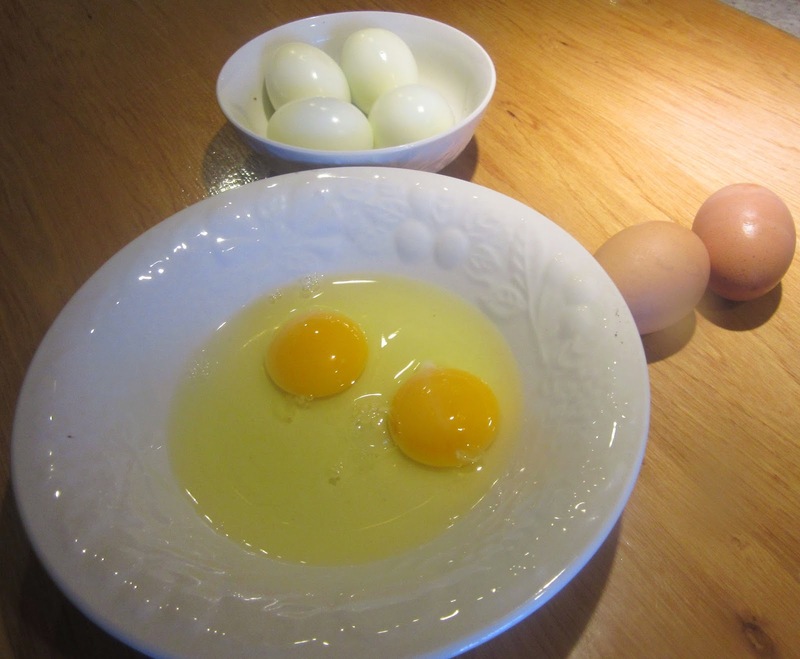 Yolks were used more often than the white for a nutritious meal in medieval cookery. If the oil is extracted from the yolk, Avenzoar continues, it relieves pains produced by heat as well as cold, except that derived from German measles. Avenzoar states that eggs are healthy and very nutritive if left to cook until hardboiled. He recommends them when the ‘stomach is loose’. 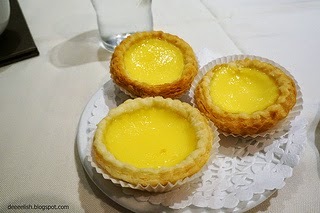 If soft boiled, he continues, they are said to calm the cough of those who have irritated lungs from dust and smoke and relieve the trachea after consuming dry food or others that irritate the trachea, such as bitter or highly seasoned food. If eggs are eaten soft boiled, they were thought beneficial for ulcerated intestines and for pains produced in the stomach and intestines by ingesting poisonous substances. They believed to be antidotes although not very powerful, against poisons in general. 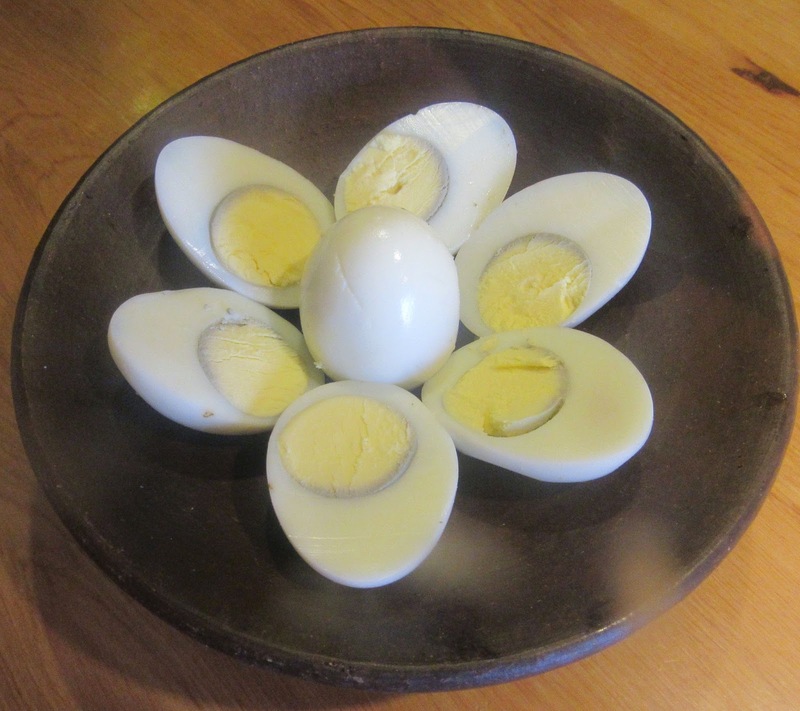 Boiled eggs are said to be of Persian origin. 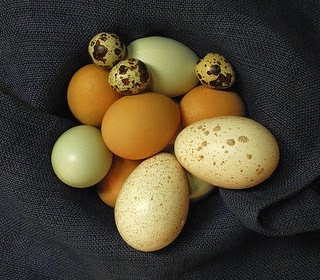 The English did not boil their eggs until the 16th C although they did pouch them often. In the past eggs have been a dish in itself or incorporated into the majority of main dishes. Their colors and glutinous effect added at the last minute were the essence of ancient cookery. In medieval times, they were appreciated as singular nourishment for their genetics and originality, for their liquidness and their hardness, after treating. There were various ways of preparing eggs. Important egg dishes included poached, scrambled, boiled, deviled and covering as an omelet or cake. One of the favorite Al-Andalus dishes was eggs cooked in oil, vinegar and brine and coagulated over the fire. Another favorite was boiled eggs in broth, served like soup with the addition of cilantro and normally finished in the oven. A recipe survives mixing eggs with cream cheese, adding them to dough, frying them and then covering them with honey. On other occasions they were presented with caviar. A recipe for scrambled eggs, attributed to Galen, was popular. 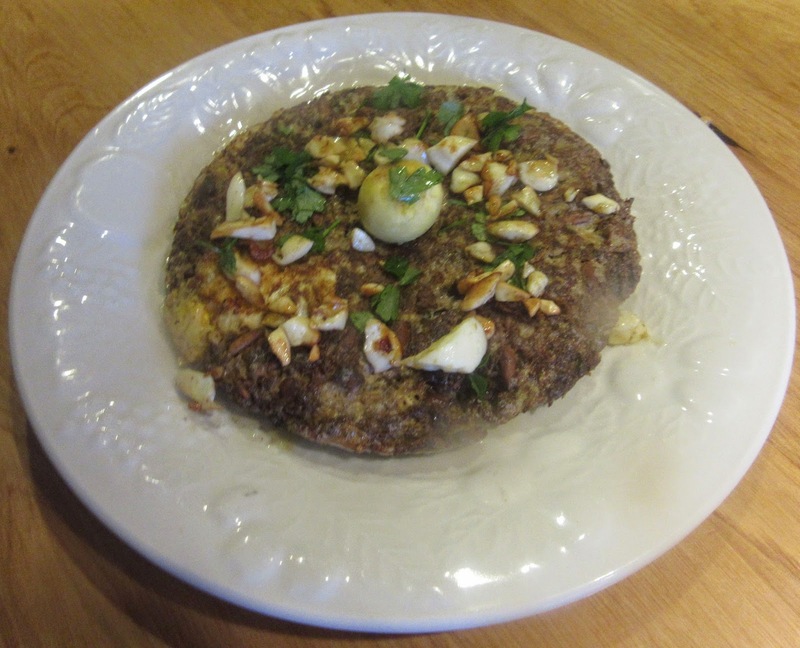 It consisted of blending beaten eggs with oil, vinegar and macerated murri and cooking the mixture. Another recipe consisted of adding eggs to broth with cilantro and baking them in the oven. Avenzoar claimed this is a noxious meal that causes grave illnesses that are difficult to cure. It was, nevertheless, worse to add eggs to fish and cook them together, Avenzoar continues, that the results of this meal are worse than poison. When served at the English dinner table they were not shared between two eaters like other dishes. It was considered bad manners to eat more than two eggs at a time. Note that frequently the number of eggs called for in medieval recipes should be reduced as eggs are bigger today. Too, now the intensity and duration of light can be regulated to control production. Once this is accomplished, the chicken not only lays bigger eggs but they are stronger too. [Alonso Luengo. 1994:37; Benavides-Barajas. Nueva-Clásica. 1995: 113-114; Hartley. 1999:208-222; and Ibn Zuhr/García Sánchez. Chop meat and pound it. Heat a frying pan. Add oil. When hot add meat and seal it. Put the meat in a pot with vinegar, two pounded onions. Put cilantro in a food processor with 1 c water and grind. When the leaves are well ground strain and save the juice. Add this to the pot. Pound walnuts and add them to the pot with whole pine nuts. Cover all with water and bring to a gentle boil. Boil gently until meat is tender and water has evaporated. Take 1 cup of this mixture and mix it with two eggs slightly beaten. Heat fry pan with olive oil and pour the mixture into the pan. When the omelet is browned turn and brown the other side. Remove from pan turning it onto a plate. Repeat the process until all the mixture has been made into omelets. Take 4 eggs and hard boil them. Peel them and fry them in olive oil. They can be fried whole or the yolks and chopped whites can be fried separately. Garnish the omelets with the hard boiled and fried eggs. Sprinkle with pepper and chopped rue and serve. See blog titled almorí de pescado published August 25, 2011. Por isfiriya, que es el abrāš [pancakes SLW]. Cut up any kind of meat you wish and put in a pot, and throw on it three spoonfuls of vinegar, one spoonful of murri, as much spice as you need, two onions pounded with salt, the juice of a large handful of cilantro, what pounded meat you want, and likewise pounded walnuts, and a handful of whole pine nuts and water to cover all until it cooks. Cover [the contents of the pot] with two eggs, then break however many eggs you want and brown them well and make of them a fine tajine, and turn them into the frying pan until they brown on both sides. Cut up like isfîriyya and fry it in the pot. Ladle it out and sprinkle with pepper and cut up rue, and serve, God willing. And if the meat is coarse, fry in oil and throw after that into the pot.